TRIFECTA is pleased to announce the Generation II Chevrolet Cruze MY2016--2018+ vehicle software recalibration (reflash) for vehicles utilizing the 1.4L turbo (LE2) engine with either the 6 speed automatic transmission (6T35 / RPO:MNU) or 6 speed manual transmission (M32-6/ RPO: MF3). Specific gains over factory calibration are up to (uncorrected) 97lb-ft of torque and 59 horsepower, with peak gains showing at up to 74lb-ft of torque and 51 horsepower, with no vehicle modifications beyond the calibration. The TRIFECTA Powertrain Calibration for the Generation II MY2016--2018+ Chevrolet Cruze includes a TRIFECTA flash loader. If the engine is running because no auto-stop event could occur due to the cruise control system being disabled, enabling it will cause the engine to stop immediately, provided all of the other auto-stop criteria above is met as well. Customized operating system enhancements allow for zoning of knock adaptation factors to provide superior dynamic knock detection and control. Allows for operation with improved power profiles under factory-specified minimum fuel requirements (“87 octane” – see owner's manual for full details) as well as fully optimized power with higher octane fuels. The TRIFECTA Elite Calibration offers premium tier-1 support. With this product, customers can request specific calibration changes and support for third party hardware. Remote-tuning services are offered with this tier. Love the product car has so much more power and still keeps it mpg!!! I cant recommend enough this product, I did alot of research before I went with trifecta & in all the forums they kept popping up. I went with the elite so I could do some fine tuning to my personal driving preference, the standard tune they send is great it shift very quickly & you will notice IMMEDIATELY a huge difference in power. I knew when I changed my exhaust system & added the AEM intake it may change the tune. They were worked with me & I now have several, there named by me but I have a performance economic which is slightly lower in power but very high in MPGS. Now when I'm comparing it in power I also have an extreme tune which eats twice the gas or more but it will take the car to its absolute limits. My coworker has a new accord sport turbo & that tune absolutely smokes him on the Texas tollway. Now all the tunes have amazing take off power , the Cruze has potential & trifecta can get as much or as little as you want out of it. Hi! I have a 2017 Chevy Cruze RS hatch manual transmission. Mods are K&N intake kit and GM performance cat-back exhaust. 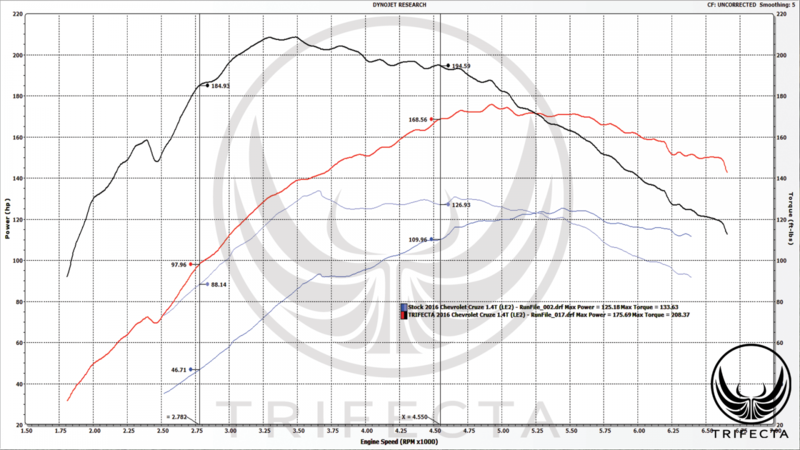 The Elite tune software provided by Trifecta is my very first tune on any car i own. 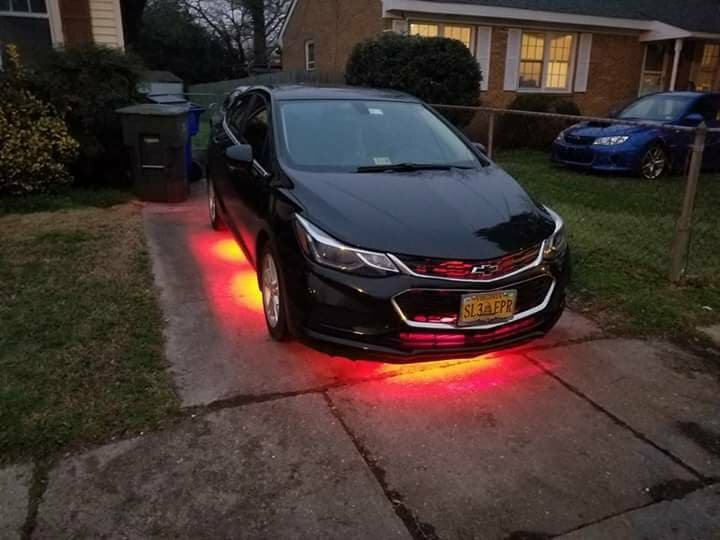 So after I got the calibration tune from trifecta I immediately started the process of flashing my tune in my Cruze. And MAN...I was speechless! Let me tell you, after I started of my first gear on manual, just a small throttle on the gas pedal, I was pulled back into my seat. For weighing 220 lbs my 2003 toyota Camry v6 never gave me this type of reaction. The Cruze pulls very hard and speeds up drastically compared to factory specs. This tune should of been what the cruzes of gen 2 should of have out of the factory. With the mods I have now with tune is definitely faster than my 03 Toyota Camry v6. I am well satisfied and will continue to do more mods with the elite tune. Thanks Trifecta!